Josh Sorbe was announced as the South Dakota recipient of the Truman Scholarship. He is the 17th USD student to be honored as a Truman Scholar. 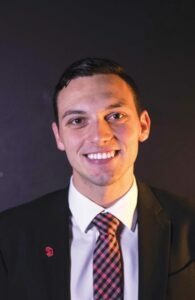 One might expect a former Student Government Association (SGA) President to pursue a path of political greatness. But Sorbe wants to be known as Mr. S to his future students first, and he’s hoping the Truman Scholarship will help get him there. Sorbe should know next week if he will be honored among South Dakota congressman Dusty Johnson, Georgia gubernatorial candidate Stacey Abrams, and 16 USD recipients. Truman scholars are eligible for up to $30,000 for post-graduation education. If selected as a recipient, Sorbe, political science and economics major, intends to use the money to attend the program “Urban Teachers” in Washington, D.C., where he will receive a master’s degree in education and gain teaching experience. If selected, Sorbe would be one of 60 Truman scholars in the nation, but he could be chosen as either a state scholar or an at-large scholar. There are two finalists from South Dakota: Sorbe and Margaret Eckerstorfer. Eckerstorfer is from Sioux Falls, S.D. and attends the University of Minnesota. UMN’s scholarship twitter account tweeted support for Eckerstorfer. “#UMNproud of Spanish major and public health advocate Margaret Eckerstorfer, who has been selected as a Truman Scholarship finalist for South Dakota. Congratulations, Maggie!” the tweet read. Sorbe or Eckerstorfer could receive the state scholar and the other could possibly earn an at-large spot unless the Truman Scholar board decides not to award a scholarship to the state at all. The Truman scholarship is not the only prestigious scholarship that has presented USD students success. Awards like the Rhodes, Fulbright, Goldwater and Udall scholarships are applied for and won by USD students regularly. Melissa Berninger, the coordinator of nationally competitive scholarships, said this is the time of year students should consider applying for these scholarships. Sorbe said applying was intense, but Berninger said the application process is a worthwhile experience. “Doing all the drafting and the work that an application requires, even if they don’t win that scholarship, that’s going to make them more prepared to apply for graduate schools or to apply for other kinds of opportunities down the road,” Berninger said. Students wanting to apply for prestigious scholarships can contact Melissa Berninger at melissa.berninger@usd.edu.